Water Pump Gasket. Fits 90~95 ZR-1 LT5. 1 gasket is required. Die-cut precision gasket, made exclusively for Jerry's Gaskets. New improved version made from tougher material with greater tensil strength. This gasket is made from Pro-Formance/MicroPore, non-asbestos gasket material with a fully cured nitrile butadiene rubber binder, 12~20% compressibility for excellent sealability and a max temp rating of 550F. See part #317 in the diagram. 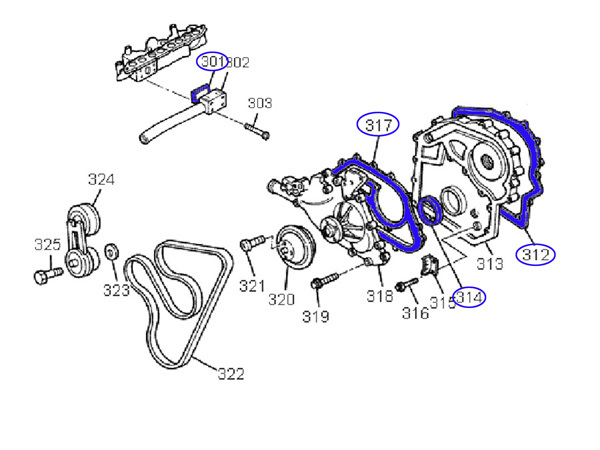 Click the button below to add the Gasket, Water Pump 90~95 [7.5E3] to your wish list.